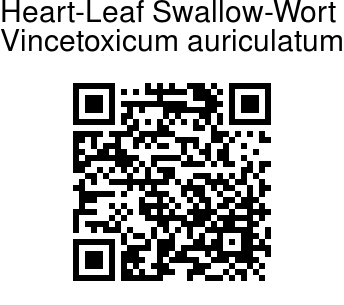 Heart-Leaf Swallow-Wort is a perennial vine, with stem twining, hollow, hairless except for a band of hairs running along the internodes. Leaves are 6.5-15 cm x 5-12.5 cm, broadly ovate to ovate-lanceolate, deeply heart-shaped, pointed to long-pointed, margin often wavy, sparsely velvety with short appressed hairs to hairless above. Basal nerves are 5-7, few small conical glands at the base of the midrib. Leaf-stalks are 2.5-8.0 cm long. Many flowered cymes are carried on 3-15 cm long stalks, arising singly at node. 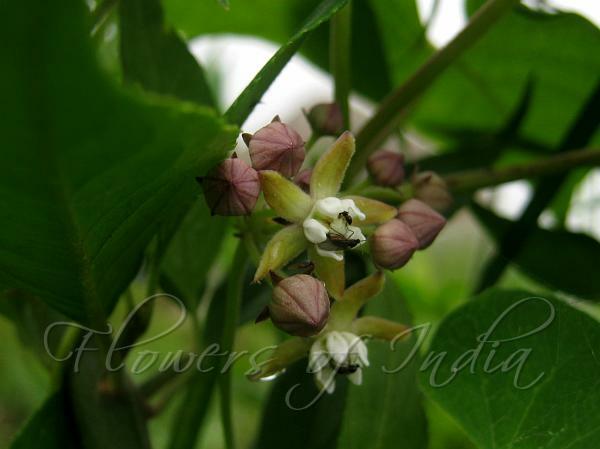 Flower-stalks are 1.2-1.3 cm long, slender velvety. Bracts are up to 8 mm long. Sepal cup is 4.5 mm long, lobed almost to the base, frilly. Flowers white to yellowish-green, about 6-8 mm long, divided nearly to the base, petals are velvety inside. Corona is cupshaped, deeply 5-lobed, lobes oblong, obtuse bearing 5 small scales on the inner faces. Style tip is conical, 2-lobed, slightly protruding beyond the stamens. Follicles are 7.5-10 cm x 15 cm elliptic-lanceshaped, smooth. Seeds are 8-9 mm long, oval, brown, compressed; coma 2.5 cm long. Heart-Leaf Swallow-Wort is found in the Himalayas, from Kashmir to Bhutan, Assam and China, at altitudes of 2000-3700 m. Flowering:: July-August. Identification credit: Krishan Lal Photographed in Sirmaur Distt, Himachal Pradesh.